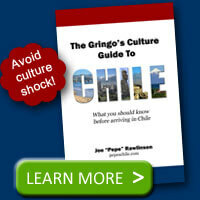 A new 5000 pesos bill will enter circulation on September 24, 2009. This new version will gradually replace the current 5000 pesos bill over time. The new 5000 pesos bill will be made of a polymer which will prolong the lifespan of the bill up to three or four times the current bills. Additionally, this new bill will incorporate new security features and will be easier for individuals to recognize the bill. 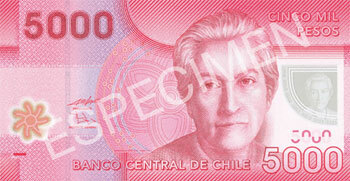 The front of the bill retains the portrait of Gabriela Mistral, based on an anonymous photography obtained from the archives of the University of Chile, but also incorporates images of the heart of the Copihue, the national flower, and the Antú, a Mapuche symbol that represents the sun and fertility. 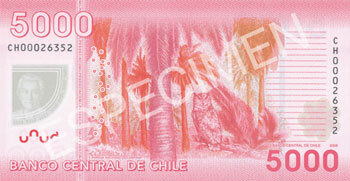 The back of the bill will have the image la Campana, a national park located in the V region of Valparaíso, which has one of the few native forests of the Chilean Palm. 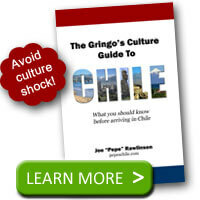 Additionally, the bill has the image of a Tucúquere, a bird of prey that lives in Chile from Tarapacá to the Tierra del Fuego. Watermark: The portrait of Gabriela Mistral, in profile looking towards the center of the bill. Colors: Red, ocre, coffee and green in diverse shades. Sistema de Impresión: Offset, Taille Douce and typography. Face: The principal motif is of Chilean poet Gabriela Mistral situated on the right side. She faces a vignette symbolizing motherly love. Reverse: The main motif is a reproduction of the image stamped on the gold medal presented as the Nobel Prize for Literature granted in 1945 to Gabriela Mistral.